As exciting and thrill-inducing as Halloween can be for children, it can also be scary for parents. There are a number of safety measures you should consider before, during and after trick or treat. Remember, the sun is setting earlier, shoppers are flooding Halloween stores and children are running around the neighborhoods – mostly in the dark. To ensure your family has a safe and enjoyable day, keep these tips in mind. Keep the lights on. Though daylight saving hasn’t kicked in yet, it’s still getting dark much earlier. Unless your town sets specific times, plan to trick or treat right after school, before sunset. This is especially wise if you live on a busy street. 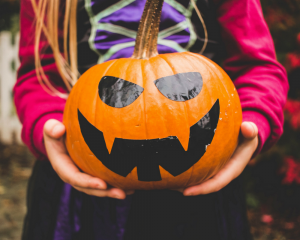 Also, keep glow sticks (your kids can wear them as necklaces or bracelets) and flashlights at the ready, so if it’s near dusk as you return home with your candy loot, drivers can easily see you and your children. Check the goodies. Halloween is [probably] the only time of year it’s acceptable to visit the houses of people you don’t know and ask for candy. Particularly if you live in a new neighborhood, try to know your neighbors before you and your kids venture up their walkways. And always, check your child’s goodies before they dig in. Discard any candy that’s been opened, re-sealed or is homemade. Practice shopping cart safety. During this time of year, stores that carry Halloween accessories can be a bit frightful when it comes to safety. With more customers in and out than usual, dedicated Halloween retailers and other stores can be tricky to navigate, especially when it comes to shopping carts. Never allow your child to hang onto the outside of the cart or stand up inside, and for younger babies, ensure their safety by using a Safe-Dock, the first universal car seat docking station for shopping carts. Avoid “trip-or-treat.” Plenty of costumes include capes, long gowns, masks and unfamiliar shoes. And with children running from house to house, Halloween “boo-boos” shouldn’t be inevitable; they can be prevented. Before you and your family venture out, make sure your children’s costumes don’t pose a tripping risk or can get caught on shrubbery. Halloween is a fun-filled family act ivity, but it can pose several dangers – unless you’re prepared. Ensure a “fangtastic” time with these safety tips!